Just because the Olympics are over doesn't mean you've missed your chance to try curling. We still have learn to curl classes you can sign up for! Sign up for our mailing list to get the latest update on club events and new. Summer Weeknight League - 6:30 - 8:30pm, details TBD, from June 19 - August 8. All leagues are open to new and experienced curlers. If you are interested in joining either league and have any questions, please just email Billy (veep@houstoncurling.com). See you on the ice soon! Thanks to all of our participants for another great set of leagues. Congratulations to the winning teams! The Friday night winter league was won by Team Reynolds (Billy Reynolds, Kelly Reynolds and Meaghan Kelly), and the Sunday winter league was won by Team Czarnecki (Gerard Czarnecki, Sara Johnson, Gretchen Retteghieri and Alex Retteghieri). Good curling to all! See you on the ice again soon. Our curlers know how to have fun both on and off the ice. 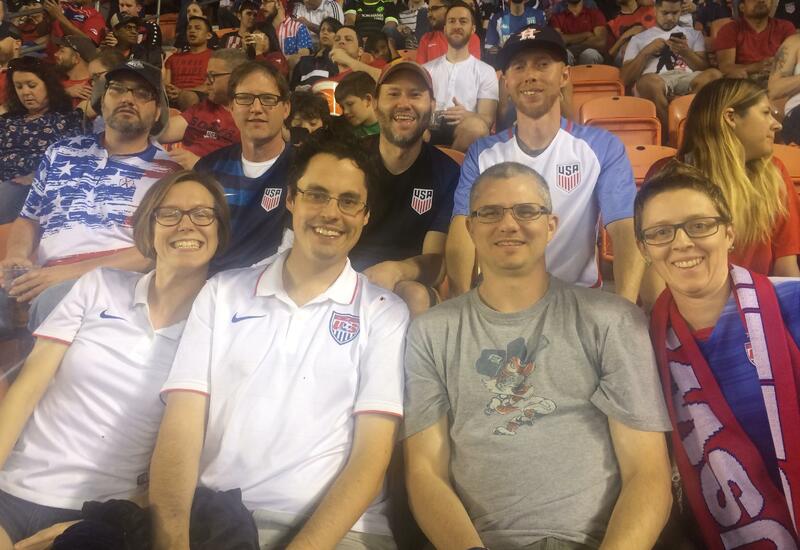 A group of us attended the recent US Men's soccer game here in Houston. Come join in the fun! If you are interested in joining us or learning how to curl, contact Patrick by email. Please consider making a donation to help maintain and grow our club. The Curling Club of Houston is a 501(c)(3) non-profit organization dedicated to increasing awareness and participation in the sport of curling. The ice center has installed a laser-level system on their new resurfacing machine, which should give us the flattest ice that we have seen in years and the truest curling game for both beginners and expert curlers. The recently-completed project to re-level the arena floor will only help to provide an even better playing surface. The club has secured two sets of newly-refurbished curling stones. We are excited to be able to curl with truer running surfaces on our rocks. As much of an engineering success as the Scribemaster 3000 was, it is now in storage. We will no longer have to paint houses on the ice before each session and will actually be able to see them on the other end of the ice as we deliver. Now that the most recent painting work is complete, we also have hoglines, centerlines, and edge lines for our sheets of ice at Bellerive. For the first time in years, we have five full curling sheets! We hope to see everyone on the ice soon. Good curling!